Paranormal Activity. Insidious. Dark Skies. This lineage of horror movies has been put out by a team of producers seemingly bent on scaring the crap out of audiences all over the world. 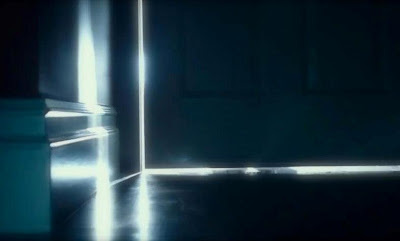 Writer and director Scott Stewart takes a decidedly different approach with this movie than his previous effects driven efforts Priest and Legion. The Barrett family has been going through some tough times both financially and emotionally, but when things start going bump in the night, their lives begin to spiral out of control. As both Daniel (Josh Hamilton) and Lacy Barrett (Keri Russell) struggle to comprehend what is happening to their family, they begin to become more and more isolated from neighbors that see them as potentially dangerous and abusive to their sons Jesse (Dakota Goyo) and Sam (Kadan Rockett). Not much else can be said about the story without travelling straight to spoiler town so we will take the nearest off ramp and go in to the more technical part of this review. 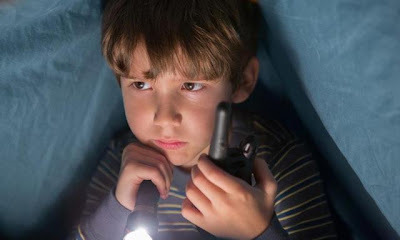 If you like scary movies, you will find a lot to like with this one as there is more than enough creepiness to go around and you are sure to jump out of your seat more than a few times. What any horror movie struggles with the most is finding creative ways to keep the audience informed without coming to a screeching halt or getting bogged down in boring exposition. 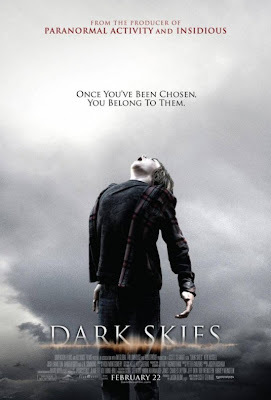 Dark Skies does not solve this problem as there are at least three points in the movie where my attention wandered while being spoon fed plot details and wading through mundane moments of what passes for character development. That being said, the intensity gets ratcheted up with enough thrills and chills to make the whole thing worthwhile. There's even a fun security camera bit that nods straight back to the Paranormal Activity franchise that put Jason Blum and his Blumhouse Productions label on the map. No, this isn't a found footage film, but there is more than enough frightening footage to keep Dark Skies shining bright at the box office.